This entry was posted in Growth Mindset, Learning and tagged Didau. Bookmark the permalink. Feedback and completing independent assignments on time is an essential part of learning because if you don’t get feedback how are you supposed to know if the work your doing is right or not, or at the level its supposed to be at. Completing assignments is important in learning because it shows that you understand the work that your given and is practice for a test or when you need to use it in real life. Not only that but it shows some responsibility if you work according to deadlines. A lot of assignments are unclear to me, same with the feedback.I feel that I’m constantly asking what does this mean or what do you mean. 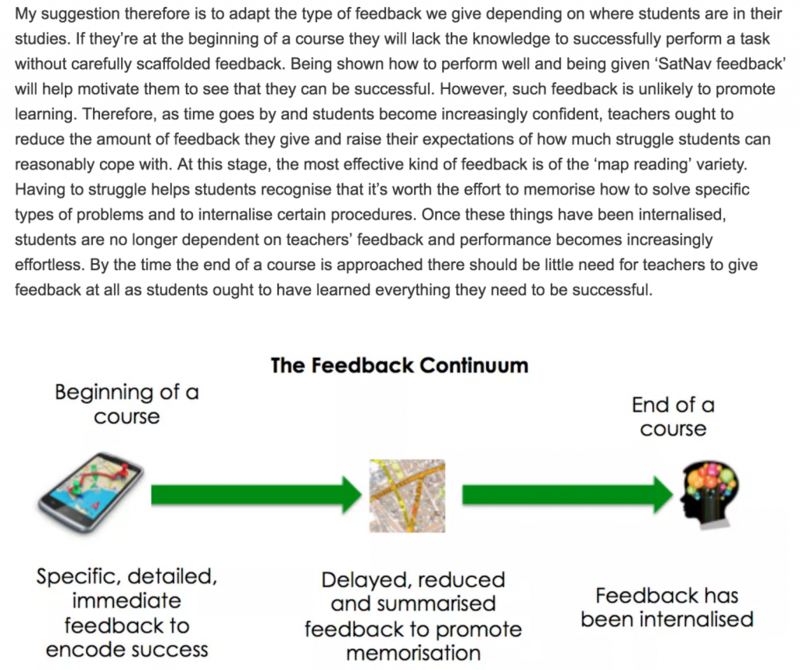 The value of the teachers feedback to their students is important because in the start in the course they need to see what they are missing in their work. Completing work on time is a huge deal because once you start missing days of school you’re going to be behind and when you don’t finish work on time it will all just snowball so big to where you put your credit on risk. When you hand in your assignments on time you’ll get feedback faster and you’ll still be up to date with the classes learning rather than falling behind. I think handing in assignments on time is a central componet of learning. I say this for many reasons. First of all your grade is going down by not handing in your work on time, second of all If you don’t hand in your work on time and your teacher is moving along your behind in your work. And if your behind in work you wont really know what your supposed to be doing with the new things your teacher is is trying to teach you. Thirdly It makes it hard on a student to learn and a teacher to teach. Completing class work on time gives the student more information on what they should be doing with their work. Once they start to get the work right they will stop relying on feedback if they got the question right. This will put their brain into independent working success criteria. As you get older you will start to realize that you don’t need feedback from others because you will be able to identify the mistakes you made by yourself. This is why you should always complete your work on time. This post has set an ideal look of understatement and with the feedback that teachers give out to students, by reading this blog post its an realization that I should always read the feedback I get from my teachers because it can expand my knowledge and not lack of work or anything. Those will be the two rules I will follow just so I can be a successful learner and have more knowledge for future courses that are related able. By completing class work and independent assignment on time can be effective to my learning and help get more things done on time. This is a very interesting theory to me and it goes bring up a good point. When it’s the beginning of the course, you DO need a lot of feedback since you don’t know what your doing. And then as the course continues, you should be given less and less feedback because you slowly begin to understand the work. The most interesting fact in the theory to me is how in the end of the course, you won’t need that much feedback anymore because you understand almost everything. I think that’s defiantly true for EVERY course in school. So all in all, very cool theory! I haven’t looked at teacher feedback this way but now that I have read this, I understand the importance of handing in work and getting feedback from the teacher, It isn’t for the benefit of the teacher it’s about the benefit for the student, being able to give that student feedback so that he/she can take that feedback to improve so that by the end of the semester the student will no longer need the feedback. I think that feedback is important to the success of students and it’s essential when working to improve your work. Feedback makes a huge difference in our pieces of writing because it helps not only us to improve, but to allow the people reading it to understand. Both peer and teacher feedback is extremely effective, because they may see your work at a different perspective. We all have different minds, and we all see things differently. I always use feedback when it’s provided, so that I can know my strengths and next steps. I think this method of giving feedback is a good way of helping students receive feedback in a more effective manner. “BUT, if you DO NOT do the work, then there is no opportunity for this continuum to kick in or for it to be effective” I’m fine with whatever kind of feedback a teacher or peer gives me. Unless they tell me a problem with my work rather than giving me a solution. It’s useless to me. You don’t need a “map reading” strategy for feedback. Just motivate your students to actually do the work. Make the lesson fun for them. If a student doesn’t come to class or do work everyday. Then that’s there problem. You can’t force someone to do stuff. That’s like telling a drunk to go to an AA meeting. They have reason why they do the things they do. I agree with handing in things on time. It lessens the hassle for the teacher.